The Zimbabwean Dollar (zwd) was established to replace Rhodesian Dollar and to signify the nation’s independence from the UK in 1980. It was redenominated 3 times until its eventual collapse in 2009 due to hyperinflation caused by unregulated printing of money, the Land reform program, and government involvement in the Second Congo War under Mugabe. 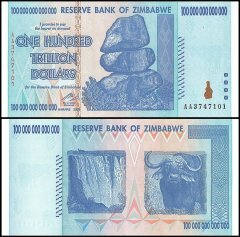 Today, Zimbabweans rely on a multi-currency economic system set in place where money (especially US dollars) from around the world has become legal tender. On the Obverse of every 2007-2008 issue Zimbabwe Dollar are the famous Chiremba Balancing rocks from Epworth, a Harare Province. These rocks are said to represent the delicate balance between man and nature. Every note in this series has a watermark that displays the note’s respective denomination when held up to a light source. A variety of different security threads and stripes run along the left side of each banknote with the type depending on the denomination and some include the letters "rbz", for the Reserve Bank of Zimbabwe. On certain notes, the obverse also has a cow imprinted on the right side of the note with grains and a color shifting security ink featuring the country’s official emblem, the Zimbabwe Bird.